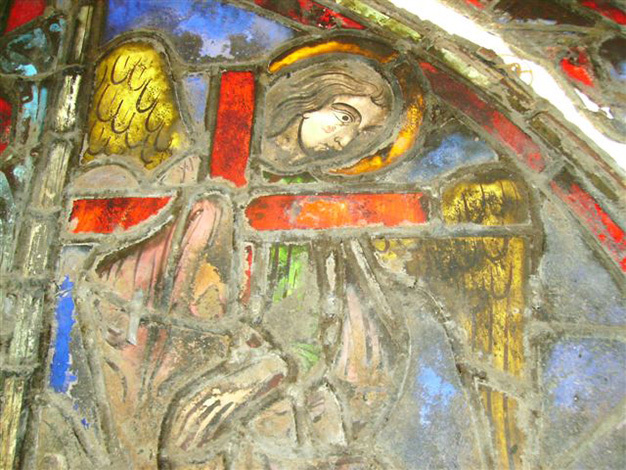 The fifteen 13th-century stained glass windows in the upper chapel are a treasure of the art of stained glass which, from the outset, made the Sainte-Chapelle famous. The restoration of the bays, which began in 2008 and was completed in 2014, and the restoration of the western rose window, consisted of cleaning the glass, the leading and the metal structures of the windows, and restoring the façades of the building and its sculptures. The work was conducted by the chief architect of historic monuments, Alain-Charles Perrot, for windows 101, 103 and 105, followed by Christophe Bottineau for windows 107, 109, 111 and 113 and the rose window. The stained glass windows were very dirty and their motifs were sometimes difficult to make out. The grisaille, that is to say the drawing deposited on the inside of the coloured glass, is less well preserved when applied after firing. On many windows it had deteriorated due to the condensation water on the wall. In addition, a varnish applied to the windows in the mid-20th century had blackened over time, darkening the windows. With regard to the façades of the Sainte-Chapelle, they too were dirty because of pollution, and the sculptures and gargoyles that decorate them had deteriorated in places; some parts were missing. What were the challenges and constraints of this site? The restoration of a work of art, even if it is necessary for its preservation and presentation, is always a trauma. Removing, disassembly, auscultation, cleaning, touching and repairing are all actions that must be performed on the actual matter. Through their extraordinary artistic qualities, their size and age, all the windows of the Sainte-Chapelle constitute a universal and unique masterpiece. Restoring such a large but fragile piece of work is a delicate operation and a heavy responsibility. There is no room for error. Hence, no old pieces, even broken, should be lost but, on the contrary, put back together. No grisaille drawing, even if it has become detached, should be allowed to disappear, particularly as any work on this type of medium is irreversible. These constraints are obviously classic and habitual in all restorations, but here they are pushed to the extreme. Great responsibility rests on the shoulders of the main contractor, yet the satisfaction felt is immense when you can stand back and admire the stained glass windows that have been put back into place, protected and saved for centuries, passed down to future generations in the best condition that you can achieve with today's technology. What did the architectural work involve? The main difficulty of this restoration was linked to the sheer number of items to restore. Each stained glass panel of a window is made up of small glass pieces, each of which raise questions which result in the choices I make. For example, am I looking at an original piece or one that has already been restored? Is the glass altered? What is the quality of the drawing? Is the grisaille well-attached? What types of disorder and dirt are involved? What interventions are needed: bonding or thin lead (if the glass is broken)? What type of cleaning should be considered? What type of treatment for the drawing to make it clearer? How to integrate the restored part into the whole piece so that the level of cleaning and restoration is consistent when the parts are assembled again? Which technique should be used for the double glazing? Which connections in relation to the interior paintings should be made? Which interventions on masonry and sculptures need implementing? Each panel must be consistent, each of the lancets grouping the panels together should be in harmony with one another, and lastly, all the stained glass windows of the Sainte-Chapelle should, together, perpetuate the magical resonance conceived by the artists of Saint Louis. The master glassmakers worked with infrared lighting to be able to read through the dirty glass and remove the varnish without altering the drawing. When this drawing had completely disappeared, it was restored on new double glazing glass applied to the old glass. The leading that assembled the panels of glass pieces, altered by air pollution, were not original and were completely replaced. The 13th-century metal bars (saddle bars) were consolidated. An experimental procedure, already applied to two windows of the apse, was repeated for the other windows and the rose window to protect the stained glass from harsh external factors and condensation by giving the impression, from the outside, of looking at the original glass . This involved setting up new thermoformed windows on the old metal structures, i.e. which were given the appearance of the original windows. This process allows the condensation water to flow over the double glazing glass and no longer on the historic glass. Some sculptures were removed, restored in the workshop, and then put back and re-sculpted directly on the building. The façades were cleaned by micro-sandblasting. 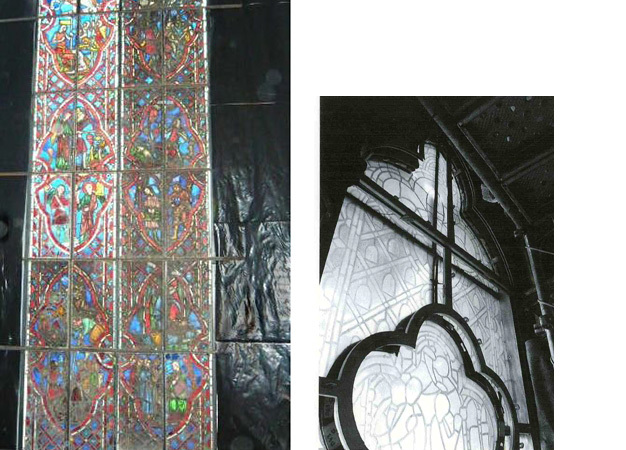 The restoration of the stained glass windows and the rose window benefitted from exceptional patronage in its scope from Fondations VELUX, which financed the operation to the tune of 5 million euros, i.e. about half the total amount required for the work. To carry out this project, the two chief architects of historic monuments called upon the skills of many service providers, bringing together stonemasons, stonecutters, sculptors and master glassmakers.